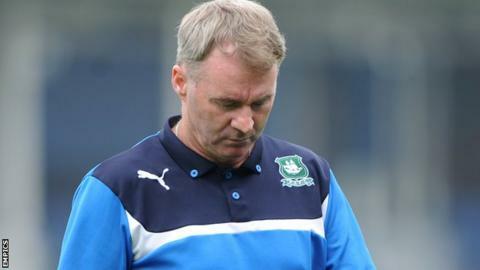 Plymouth Argyle manager John Sheridan says his side must find a different way of winning to end their poor run. Since then, the Pilgrims have taken three points from six matches in League Two and surrendered the lead to on Saturday. "We need a bit of know-how to see games through, win ugly and get three points - that's the most important thing. We just make life hard," said Sheridan. Saturday's draw with Morecambe was only the third time this season that Plymouth have taken the lead at home and not won. They have gone to win on the other 10 occasions they have gone in front, including against higher division opponents *Leyton Orient and Swindon Town in cup competitions. Argyle are now 10th in the table, a point from the play-off places and 11 from the top three. They were just five points off the top on Christmas Day. "We're down again after being at home and not winning because that's not good enough for us," Sheridan told BBC Radio Devon. "I felt we'd get three points when we went ahead because we usually do at home, but we conceded, got edgy and were worryingly naive in how we left ourselves open."